The stunning Knight triple bathroom ceiling spotlight combines a high quality polished chrome finish, sleek design and functional form. With its fully adjustable heads, this item offers a flexible solution to your lighting requirements. 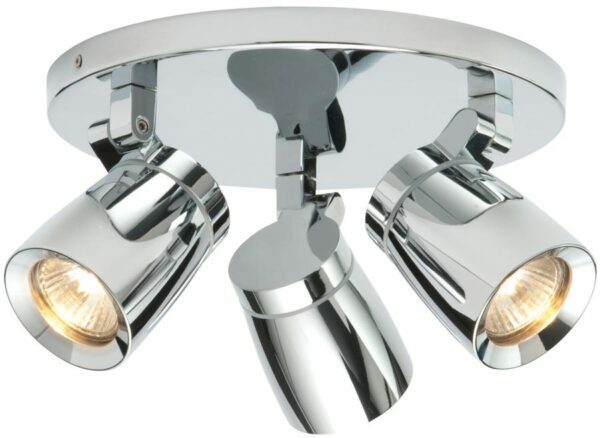 Contemporary polished chrome bathroom ceiling spotlight plate, with a circular ceiling mount and three adjustable direction spotlight heads. This sleek, splash-proof ceiling light is suitable for bathroom installation in zone 2 thanks to its IP44 rating and can also be used in other areas of the home where bright directional task lighting is necessary. Other products in the stylish Knight lighting range can be viewed below and includes a three-light ceiling spot-bar and matching single ceiling spotlight. A Class 2 double insulated product, no earth required. Please click here for installation instructions.